It takes me about a week to get my legs back underneath me when I return home from RT. I flew into Kansas City on Tuesday, April 30th and met up with some of my dear friends, people I only see once or twice a year but who have become so close to me through email and Twitter and Facebook they feel like family. Yes! That’s me in the middle, in the bronze colored skirt. And Yes! I will be having a word with my hairdresser about his love of the Asymmetrical Fringe. In fact, it’s possible that this characteristic, that defining flop of red hair over one eye that I sported in EVERY SINGLE picture of me taken at RT will become the title of my next standalone novel. Oddly enough, when I’m looking through it, it’s in no way quite as daunting as when someone is looking at me. WHO KNEW??? I miss Bel so much between conventions. We get together when we can, and since we both live in California, I get the opportunity more than I do, say, with Lynn Lorenz, who’s my sister from another mister in Texas. RT gives us the opportunity to catch up, talk to readers, dole out swag to the fans, and make trouble in cities where the local PD doesn’t (yet) know our names. OH, who am I kidding. I was in bed by ten most nights. We started off with the PIMP Your Badge event again to kick off RT in style, a workshop with all kinds of bling to tart up your convention badge. 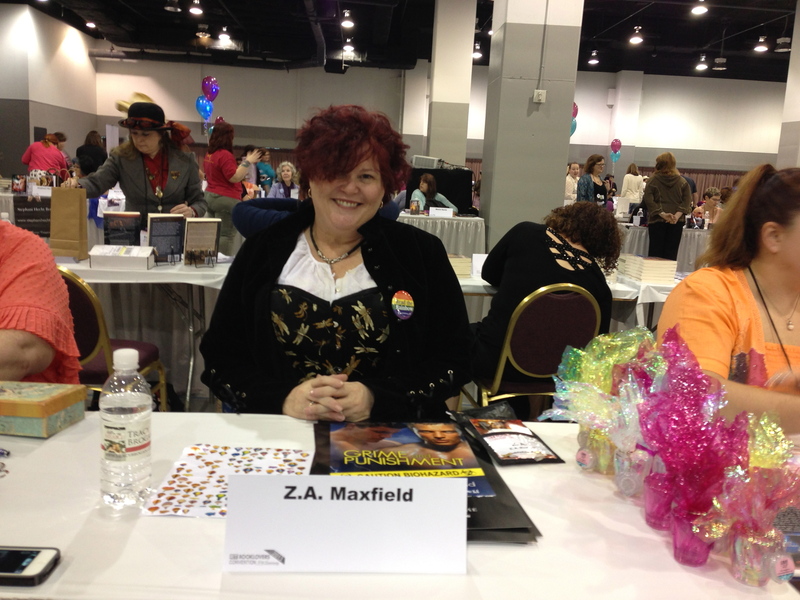 I was on several panels, like this one, the very first panel exclusively about m/m Romance at any RT, ever. That’s left to right, (WRITE, haha, get it? Sorry.) 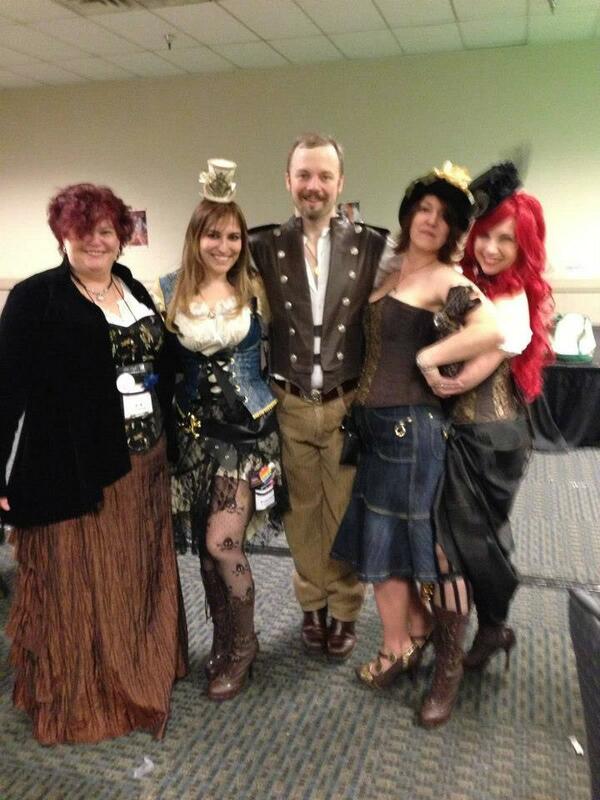 Damon Suede, Me, Belinda McBride, Tara Lain, and Amy Lane. Yes, our panel got as irreverrant as you might imagine it did. I was so grateful to be included here, as well as on a different panel with Damon, Heidi and Marie Sexton called From Brutes To Suits about the evolution of the romantic hero in literature. It was priceless hearing Damon talk about Rapey McRapersteen, the classic alpha hero of the eighties, to whom no meant you are cordially invited, clothing optional. Thank heavens for evolution, huh? 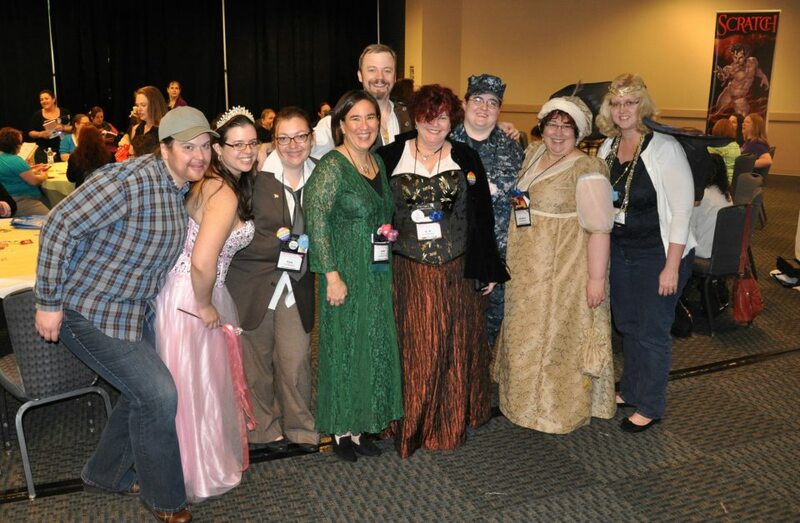 I also participated in panels on craft and attended costume party hosted by the Rainbow Romance Writers chapter of RWA (Pic at the top. No, really. It was a costume party.) Check out these lovelies! 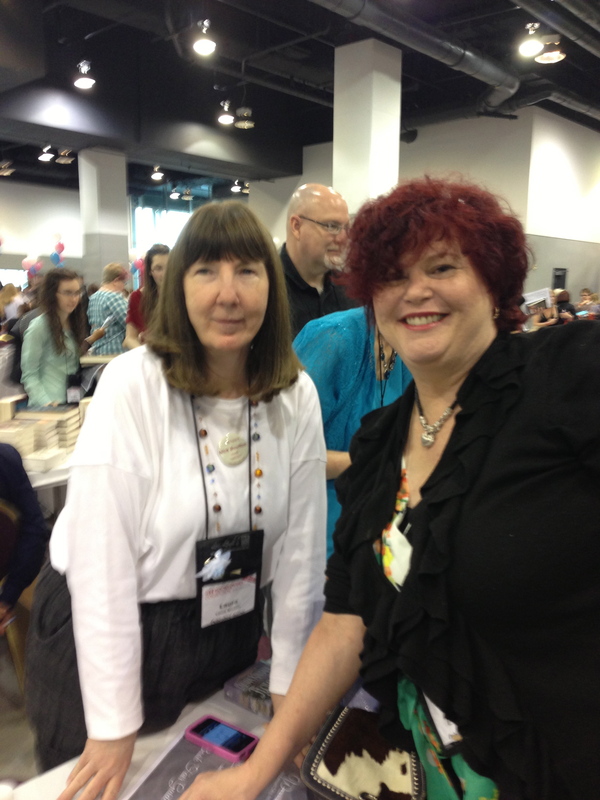 That’s me with the inimitable, unbelievably brilliant and talented Laura Kinsale, who is my favorite romance writer ever. I’ve read and reread her books for twenty-five years now. She never fails to delight me. NEVER. Every character she creates is so real they feel like they’re going to leap off the page. Every scene is so vivid it’s like watching a film. I never in a million years thought to find Laura Kinsale at this event. She’s been a little elusive lately. When I saw that she was signing, I practically hyperventilated. The fact that this is the first year I wasn’t signing at the Saturday event (because they couldn’t get my books) turned out to be a good thing. Laura Kinsale is so brilliant. And she turned out to be very kind! The Prince Of Midnight is getting released as an audiobook within the next couple of weeks. If you want to swoon, I mean really, really swoon, run, do not walk, to purchase it!! I keep looking at the audible website, waiting. Now? *taps foot* Now? *taps foot*. That book is to this day, my favorite romance novel of all time and I’ve read thousands. 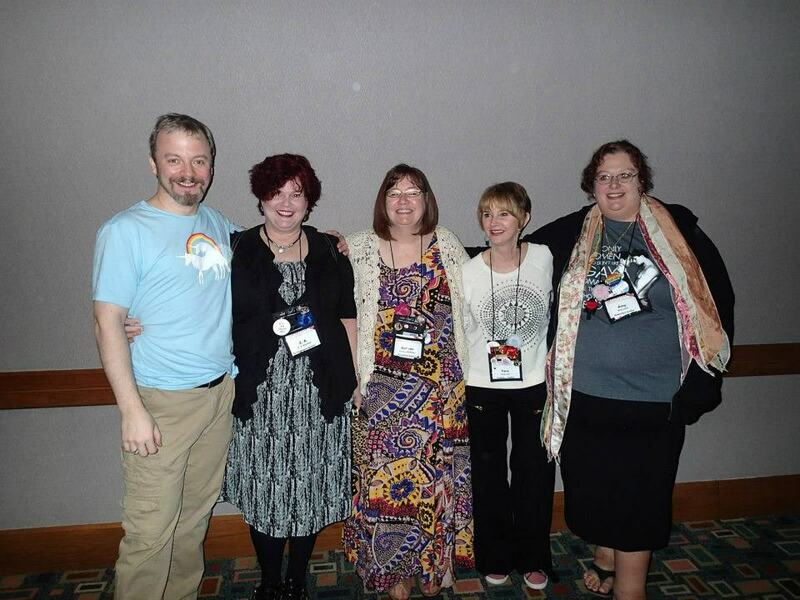 To show how Laura Kinsale sticks out in a reader’s mind, I participated on a panel at RT (RT 2013, only days before I met Ms. Kinsale) with Belinda Mcbride, Amy Lane, and Kate Pearce called Broken Wings. The topic was why we love damaged heroes. One of the things we decided to do for this event was name our favorite broken hero — that one unforgettable character who broke our hearts and never left us. I said S.T. Maitland, from the book The Prince of Midnight, and Kate Pearce said Jervaulx from Flowers From The Storm. That’s two readers-turned-writers, talking about their favorite characters of all time, who independently selected Laura Kinsale characters from two different books. Fifty percent of a panel of people who know damaged dudes when they see them. Who’ve gone on to write some damaged dudes of their own. Who cannot get these characters off their minds. I can’t recommend Laura Kinsale’s work highly enough. I bow, bow, bow before the master. I never dreamed I’d get to do it in person… Biggest thrill of my reading life. Wow. Fangirl moment. Rockstar moment. Best RT moment, ever. Never mind that it took me a week to recover from all that hard work and travel. I had the best time. For my writer friends, thank you so much for including me in your panels and parties, I always try to bring a little something fun to the table. To the readers and aspiring writers, I hope I left you with a little something to think about, a laugh or two, and some useful swag! Thanks to everyone who made the trip and the conference possible! I love you all, from the very bottom of my heart.